For you renewable energy fans out there, count this as a “half a loaf is better than none” story. Southern California Gas is partnering with researchers at the University of California Irvine’s Advanced Power & Energy Program to design an “Advanced Energy Community” in an underserved section of Huntington Beach. The plan calls for installation of solar and wind power facilities to provide clean renewable electrical power to the neighborhood but with a plus. Instead of storing any excess power in batteries, molten salt, or a pumped hydro facility, it will be used to produce hydrogen gas. In theory, battery and molten salt storage is transitory. Hydrogen created using excess electricity can be stored for long periods of time and transported (using electric trucks, presumably) over long distances. One problem California has to deal with today is that it generates more renewable electricity than it can use at times. In some cases, utility companies in California pay utilities in other states to take the excess power off their hands. 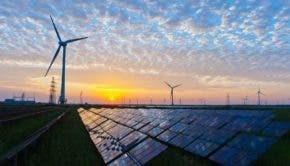 According to WindPower.com, a study by Lawrence Berkley National Lab published this year claims that by 2025, between 3,300 and 7,800 gigawatt-hours of excess solar and wind energy will be curtailed in California, which means it is either wasted or sent out of state. The hydrogen gas made from excess electricity could be used to power fuel cell cars and trucks or it could be blended with natural gas and used in anything that is gas fired, from clothes dryers and furnaces to electrical generating plants. It can also be converted to methane and pumped via natural gas pipelines. You didn’t think a natural gas company would give up on selling natural gas, did you? That “new” methane will not be zero carbon, of course, but at least it will be carbon neutral, something ordinary methane most definitely is not. And it will not have the horrendous environmental impacts associated with fracking. SoCalGas has installed a new type of bio-reactor at the U.S. Department of Energy’s National Renewable Energy Laboratory in Golden, Colorado. The pilot project will assess the commercial viability of power-to-gas technology and provide insights into potential megawatt-scale system designs. If all the excess solar and wind energy the Lawrence Berkeley lab predicts will be created in California were converted to methane and stored as renewable natural gas, it would provide enough energy to heat up to 370,000 homes or provide enough electricity for up to 187,000 homes. The takeaway from all this is that using excess electricity to make hydrogen and/or carbon neutral methane is better than nothing. It is to the energy industry what the Toyota Prius was to the auto industry 20 years ago — a small step in the right direction. It’s at best an interim step on the path to a world of fully renewable energy, and for that, we should be grateful.